Back at the dawn of .NET I wrote a useful little tool for myself called Seeker. 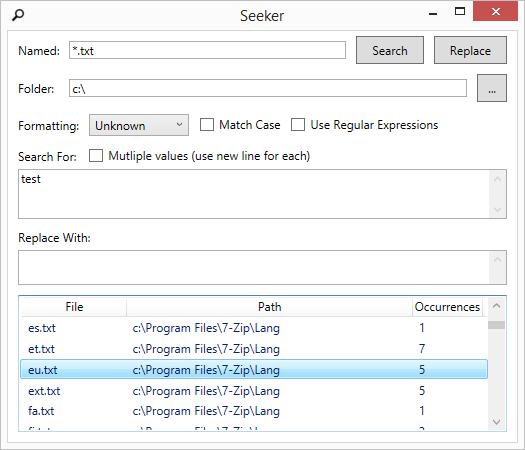 Seeker is just a simple GUI Windows app that could search for text in your file system and optionally replace it with other text. To this day I still use this tool on a regular basis and have often thought about updating, open sourcing and sharing it with the world. Today’s the day! Search files of any type for text. Optionally replace text found with different text. Search for multiple entries in a file. Control the encoding used to search and replace files. By default, encoding is automatically detected and preserved. Aren’t there already other tools out there that do the same thing? Certainly, there are a number of great options out there already. Windows Explorer itself allows you to search for text in files and the first grep tool was probably invented before my time. So why did I write yet another search and replace tool for Windows? A few reasons: 1) Way back in the day, it served a fun little weekend project to help me learn .NET 2) I needed all the features listed above and was having trouble finding a free version that did everything I needed. Yes, I’m cheap 😉 3) I wanted to be able to easily modify it if special needs arose. Warning: Seeker is a very powerful tool and can be configured to change text in any file that you have permission to modify. Therefore, Be VERY careful when doing replace operations to ensure you don’t accidentally modify files you don’t intend to. There’s no ability to undo so use at your own risk. Seeker is also 100% open source and can be found at seeker.codeplex.com. Please post feedback either here or on CodePlex and enjoy!